Traveling through Bolivia, we spent two days on a journey to Tiwanaku. However, we did not go directly there. We stopped at an important place on the way, a Portal to the ancient city. On a height of land, off the road from La Paz, 13,000 ft above sea level, is a natural altar. 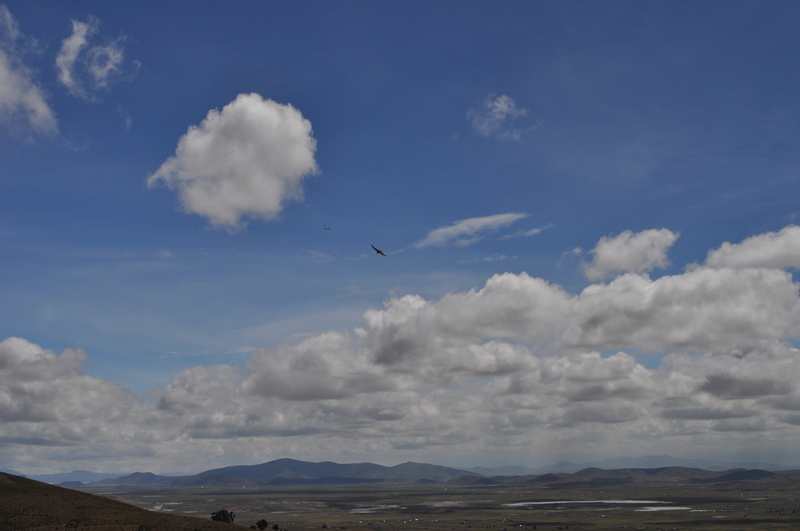 (See the picture above with Karakara, the Andean Hawk blessing our way.) As our spiritual guide pointed out, many, big, floating energies are there from the Altiplano, the huge mountains of the Royal Range, and from Lake Titicaca. All that energy is centered in this place and it can be felt, directly. The piece of land is actually in the shape of a heart. Consequently, our meditation centered around a ‘Heart to Heart’ communication with all these powers. We left offerings of flowers there. 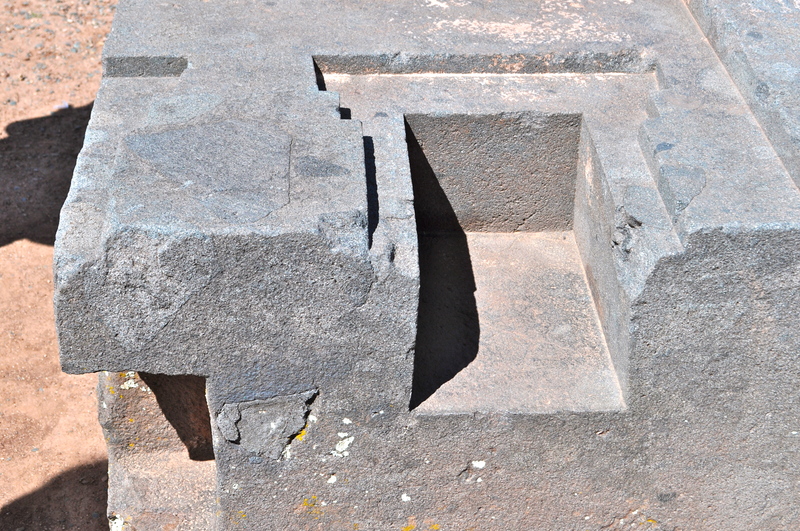 Among other things, we asked for permission to go visit Tiwanaku, the City of Initiation. Stopping at this portal and asking properly for permission set the stage for welcoming experiences at the ancient city. When a place as old as Tiwanaku is discovered, many theories arise as to who built it and what its purpose was. They are all inconclusive, because nobody knows for sure. 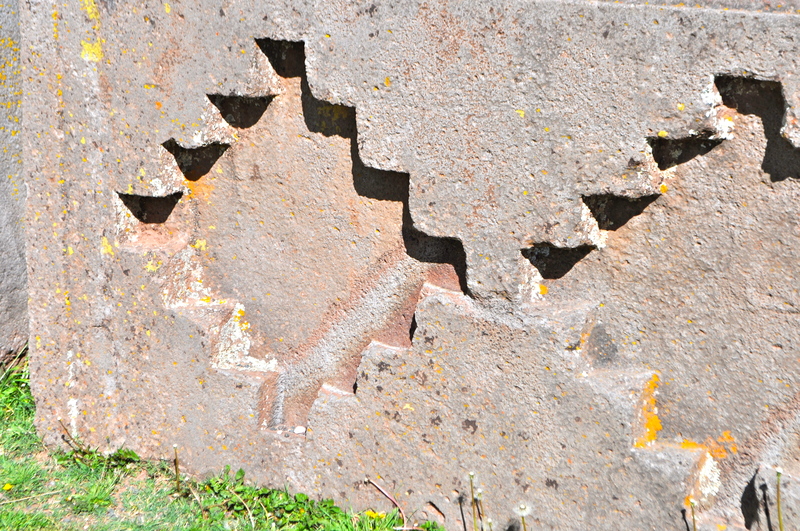 Some say that it was built as many as 17,000 years ago and that it was a port city that bordered Lake Titicaca. There are some things that we do know. There was an advanced agricultural technique employed there. Also we know that many of the stones there came from Quimsa Chata, a volcanic mountain located to the north which has great feminine energy. They call it “WAKA” which means “sacred’ in the old language. The green rocks are full of copper, an amazing conductor of electricity. In fact, I can tell you that being on location at Tiwanaku, your skin actually turns yellow because of the high level of magnetism in the rock. I have heard that the magnetic grid on the earth facilitates the entanglement of cosmic energies from other dimensions. Perhaps there is a connection. Why is the magnetic content of the rock significant? The Telluric, or life force energy from the Earth is a current of power, capable of conducting communication. At Tiwanaku, it is especially strong, probably because, as a City of Initiation, there was much information to be received and sent. While I did a meditation there at the site of the now destroyed Andean Cross of the Akapana Pyramid, an amazing thing happened. I felt myself levitate off the ground. While sitting there, lifted off the Earth, I had rotating around me, a circle of white light, like a hula hoop. Attached to this hoop and rhythmically spaced, were several blue balls of energy. This entire contraption was spinning around me for several minutes. It felt amazing. 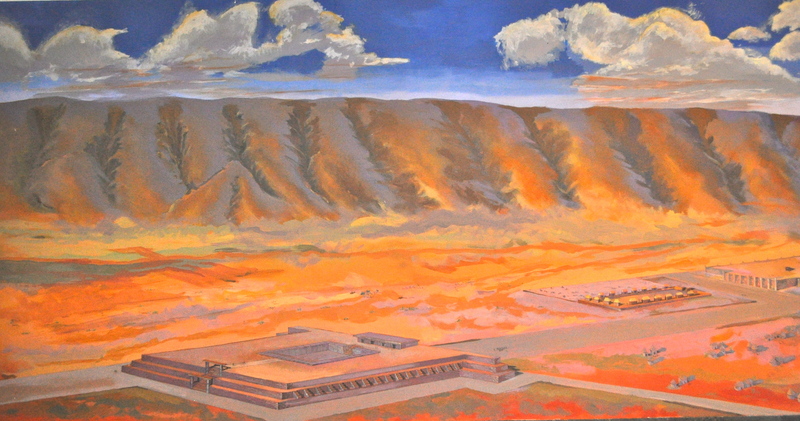 When I asked one of my spiritual guides there, who had been the lead archaeologist at Tiwanaku for 9 years, he said that my experience was easily understood. Not only is the magnetic strength extremely high there, but under the pyramid is a pattern of water channels that exists in a labyrinth of tunnels which he has explored. Whoever created the place, made it so that the energetic information required by the initiates was magnified by the magnetic forces in the rocks and then re-enforced by the underground patterns of water, similar to the way Reiki healing patterns work today. However, these forces were all used, according to the archaeologist, in order to ascend to higher levels of attunement. I believe that visiting sacred sites like Tiwanaku helps a person to become attuned to the activations from different dimensions. There is a tremendous amount of energy there. 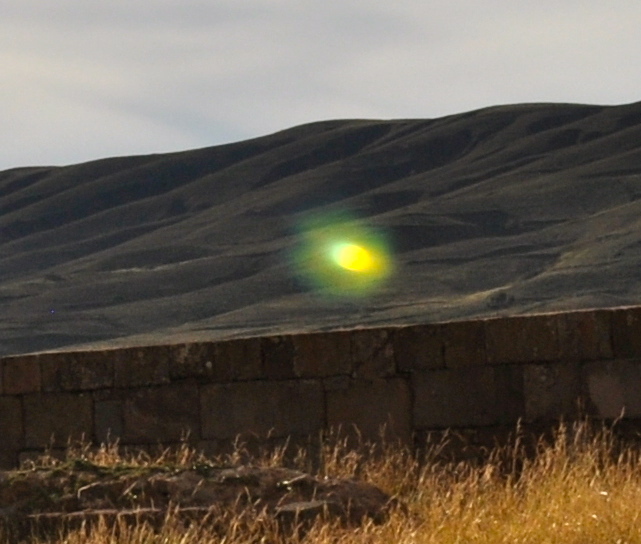 Please check out my picture, (2 above) of the yellow ball of light energy taken near the Sun Gate. If you approach these ancient sites, with respect, stopping at the portals to gain permission, it can be a positive, initiatory experience. If it is possible for you to journey with us this coming autumn back to Bolivia for some time at Tiwanaku, it will be worth your effort. Next week, I will include more of my experiences at Tiwanaku. PLEASE click below to leave comments.